Women in the Medieval Church: Did You Know? THE FIRST AUTOBIOGRAPHY in the English language was written by a Christian woman, Margery Kempe, who lived in the early 1400s. In the early Middle Ages, it was not uncommon for an abbess (the female head of a religious community) to rule “double” communities of both men and women. One who did so was Hilda of Whitby (614–680), whose abbey became famous for its learning and libraries. Five future bishops were trained in her community, and kings and rulers sought her advice. Many women joined the Crusades. They began to be required to gain their husbands’ consent before leaving. Christian women often corresponded with—and gave advice to—the most prominent leaders of their day. Heloise (better known for her relationship with famous philosopher Peter Abelard) maintained a significant exchange with Peter the Venerable, the influential abbot of Cluny. The two discussed theology and spirituality at length. Anselm, later Archbishop of Canterbury (1093–1109), corresponded with Queen Matilda on matters of religion. Of all the recognized saints between 500 and 1200, about 15 percent were women. Some Anglo—Saxon queens appointed bishops. Queen Emma of Normandy, one of the most powerful people in England in the early eleventh century, clearly did so. So did Edith, wife of Edward the Confessor, the English king who built Westminster Abbey. Boniface, the great missionary known as “the apostle to the Germans,” specifically requested that women be sent to aid him in converting the pagan Saxons. One of the approximately thirty women who went was Lioba, who became so widely respected that she was invited by Charlemagne’s queen to visit the royal court. The first English book known to be written by a woman was written by a Christian, the influential writer and visionary Julian of Norwich. Almost all European Christians, from the mid-thirteenth century on, believed there had been a woman pope. Pope “Joan,” disguised as a man and known as Pope John, was said to have begun her reign in 855 (other versions said 1100). Her alleged reign—for almost three years—ended when she gave birth while riding in procession. The story was so widely held that a bust of Pope Joan was placed in Siena cathedral in about 1400, and John Hus spoke of her while on trial shortly before his death. Not until the mid-1500s was the story repudiated. The Waldensians, a group beginning in the twelfth century that has been described as “Protestants before the Reformation,” were charged with allowing women to preach. In the later Middle Ages, some Christian women chose lives of prayer and solitary confinement in their pursuit of holiness. These anchoresses, as they were known, often lived in a small room attached to a church. Windows allowed them to look into the sanctuary, to view the services there, and to look out into the village, to be able to buy food and necessary supplies. The first known morality play, an important form of drama in the late medieval period, was written by a woman Hildegard of Bingen, the twelfth-century German abbess. Holy women so valued their virginity that in some extreme cases they cut or disfigured themselves so they would not be molested by marauding invaders of their monasteries. One who did so was Ebba the Younger, abbess of a remote monastery in Scotland during the wave of Danish invasions in the late ninth century. Fara, a saint in the late 600s, founded a joint community of men and women in the north of France, where she ruled as abbess and assumed priestly and episcopal powers, hearing confessions and excommunicating members. Abbesses continued to hold considerable authority; as late as the thirteenth century, certain abbesses had to be halted from hearing confessions of their nuns. Anna Comnena, daughter of Byzantine emperor Alexius I, wrote the most detailed history of the church of her time. Women made extensive pilgrimages—often with small retinues—to the Holy Land. One such pilgrim was Margery Kempe, who traveled (without her husband) first in England and then to Rome and Jerusalem. Women played a role in helping to end the “Babylonian Captivity” of the church, the nearly-70-year period in which the papacy was exiled at Avignon, France, in the shadow of French royal power. Birgitta (or Bridget) of Sweden strongly urged Pope Clement VI to return the papal see to Rome. Later, Catherine of Siena spent three months in Avignon and successfully persuaded Pope Gregory XI to return to Rome. 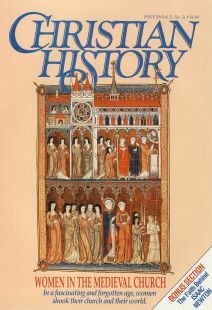 Eleanor of Aquitaine (the twelfth-century queen of England and France, and generous supporter of Fontrevault Abbey) wore the color of mourning—white—to her wedding. She thus set a precedent for brides in all centuries since. Jeannette L. Angell is a doctoral candidate in history and liturgics at the School of Theology, Boston University. Despite countless books, conferences, and theological debates, the role of women in the church is far from settled. A glossary of terms relating to religious life of women in the Middle Ages. From birth to death, a peasant woman’s difficult life intersected the church.